Today was a real treat. Mike, Scott and I rode to Newport Beach from Diamond Bar. 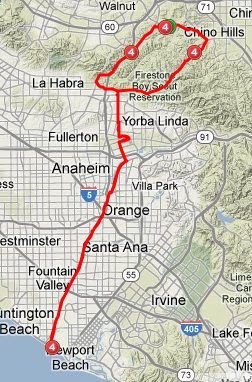 The treat was we (Mike and I) rode fixed, and by way of Carbon Canyon to Newport Beach. 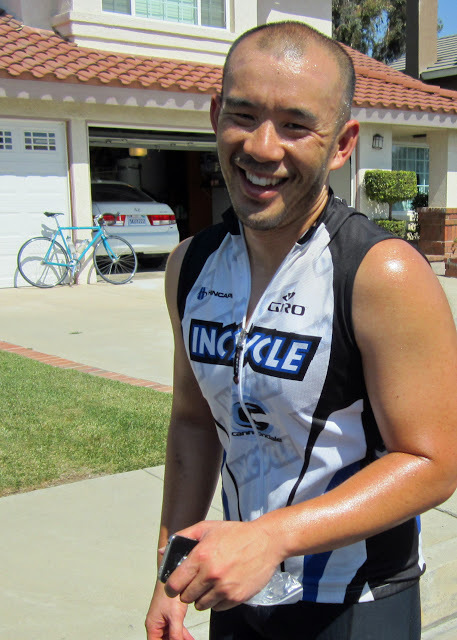 This was my first time riding thru Carbon Canyon and I was surprised by some of the steep sections thru the canyon. I wasn't feeling to great in the morning and I was SOOOOOO over the descent and the super high RPMs. We made good time and were in Newport Beach at about 8 am. A quick bio-break, refuel and it was time to head home. The trip home was made thru Brea Canyon. It was hot and I wasn't going to tackle Carbon Canyon. In the end the trip was about 72 miles. Not to shabby. So with all the 72 miles of riding, I only managed to shoot one picture. It was at the end of the ride and as an unfortunate after thought.